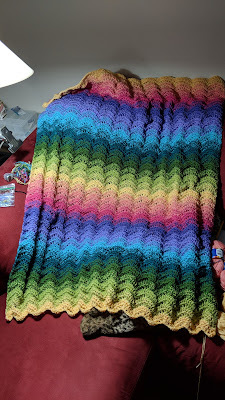 I finished the Northern Lights Afghan. It was one of the first Herrschners kits I had bought. 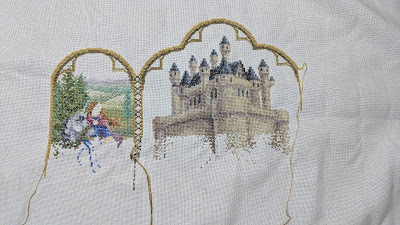 So I have moved on to the next cross-stitch in my rotation, Cinderella and the Prince. Apparently I didn't get very far when I first started it. I will be converting this to parking, which is a tiny bit of an annoyance. Also, those two 4 point symbols being next to each other will make things a bit tricky. I already realized I had used the wrong color for five stitches. So I switched to a crochet project that's been in my closet for a while. And I (re)discovered ebay. These plus 2 not pictured, plus 3 more charts on the way of carousel horses. I don't feel like I made much progress. 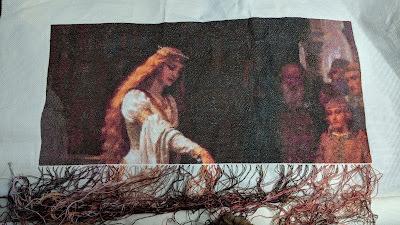 I know there were days I didn't stitch. 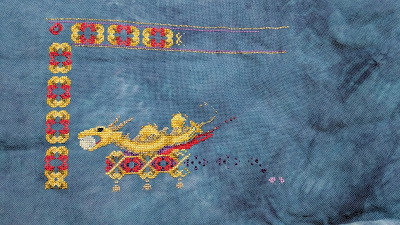 Somehow I managed to finish page 1 of Dragon Carousel (minus some long things on the border that I'll work on during subsequent pages). Photo really doesn't show how sparkly it is. Most of the gold has kreinik of some kind blending with it. And here's a photo I took during the snow storm. So I finished page 3 of the Triptych. Picture does not do the sparkly-ness from all the Kreinik justice. And I may have to change my blog update day as my new schedule for the foreseeable future is Wed-Sun. Thus this post on Monday. Currently debating whether to press purchase on my current Herrschners cart.